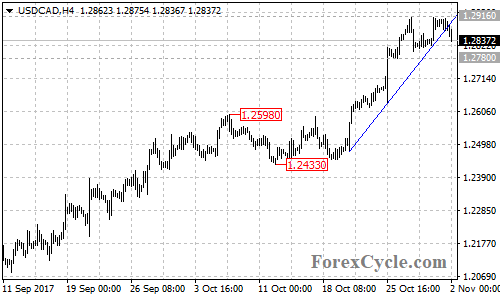 USDCAD failed to breakout of 1.2916 resistance and pulled back to break below a bullish trend line on the 4-hour chart, suggesting that lengthier consolidation for the uptrend from 1.2433 is underway. Range trading between 1.2780 and 1.2916 would likely be seen in a couple of days. As long as 1.2780 support holds, the uptrend could be expected to resume and further rise to 1.3100 area is still possible after the consolidation. On the downside, a breakdown below 1.2780 support could signal completion of the uptrend from 1.2433, then the pair would find next support at around 1.2600.